I’m working on a new series called “What I Eat in a Day” where I will post just that, exactly what I eat in a day. This will help anyone needing some plant based meal inspiration! You can check out more info on my typical daily meals HERE. *this pic was taken at the end of summer when watermelon was still in season lol, I’m a little last posting this up. Next I have my turmeric tea which consists of turmeric paste, a squeeze of half a lime, a tiny drop of coconut oil to make it more bio-available and half still water and half hot water. You don’t want it boiling hot, just warm enough. This turmeric tea helps to balance the ph in the body and helps to stimulate digestion. About 15 minutes later I had some watermelon, this was probably 1/4 of a decent sized watermelon. Eating watermelon first thing in the morning is the BEST thing you can do as it’s super hydrating and the fastest of the fruits in term of digestion transit time. Probably about an hour later I had my large smoothie which is pretty much a meal replacer and keeps me full for hours. It is half cherry + banana & moringa powder + banana. So I used 3 bananas and 1/2 cup or so of frozen cherries, and then 3 bananas and a small spoon of moringa powder. I also blended in ground flax and chia seeds for some healthy omegas! The liquid I used is half unsweetened almond milk and half water, I just make it to my desired thickness. Moringa is antioxidant rich a great anti inflammatory agent, has hormone balancing properties and is great for the skin health with it’s antibacterial properties. It’s super rich in Vitamin C, Vitamin A, potassium, protein and calcium as well. Check out more info on moringa HERE . I will add it in my smoothies, and I’ve also started making a yummy tea with it with hot water and some dairy free milk and a sweetener like coconut sugar. I like to eat all fruit for breakfast because it’s best to eat simply with easy to digest foods in the morning as your body is just now waking up as I mentioned above. Fruits have the quickest transit times, are full of energy, fiber and nutrients to keep you going. Plus they are super hydrating. My huge banana smoothie keeps me nice and full for hours but when I start getting hungry I still like to snack on some fresh fruit and what I had was a handful of organic red grapes and 2 pulots aka dinosaur egg plums. Maybe 30 min or so later I had two Brazil nuts which is great for skin health, two dates (these are my favourite as they truly taste like caramel candies!) and two homemade oatmeal banana cookies. Large salad with mixed veggies, romaine lettuce and mixed greens. I always have a salad with my meals, it’s a great way to make sure you’re eating something raw and green in the day. If I don’t have a salad then I’ll try to make sure I get a green drink in at night. For my dressing I just simple put a spoon of tahini and made sure everything was well tossed and covered. I made some brown rice pasta with a variety of sautéed veggies (mushrooms, sun dried tomatoes, onion, garlic, and frozen kale and spinach mix) in herbs like parsley, oregano, basil, thyme and fennel. I like to top it off with some nutritional yeast (not an activated yeast, great source of B12 and has a nice cheesy like flavour). Digestive period: From noon to 8pm the body’s metabolism is geared towards digestion. When the body is in digestion mode it requires a lot of energy to complete it’s job, so it only makes sense to eat your biggest meal of the day around this time. The earlier the time frame, the better (the Ayurvedic system of medicine says the time of optimal digestive power is 10 am to 3 pm). I personally eat my biggest meal between 2pm and 6pm, and drink my nightly green drink by 8pm. Meet Up with Fellow Eczema Warrior Abby! This just seems so super sugar heavy – perfect recipe for candida overgrowth. 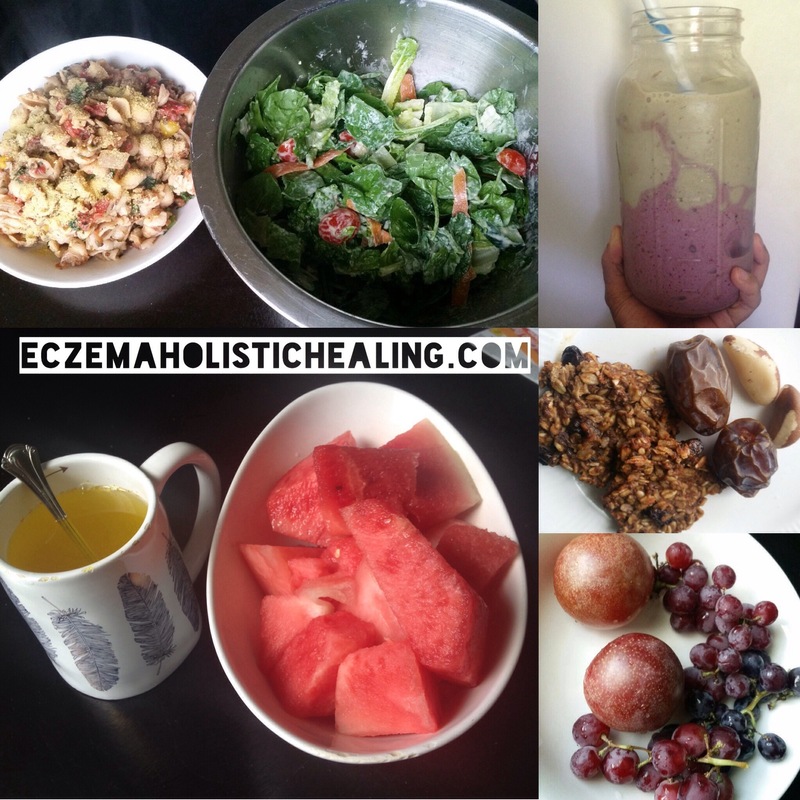 From all the fruit first thing and throughout the morning, to the brown rice pasta in the evening, it just seems like you’re feeding candida, which is a huge factor in eczema and so many other auto-immune diseases. Maybe Ive been ill-informed about fruit sugars, but from what I’ve learned, too much fruit can be just as bad as too much cane sugar. I hope I haven’t offended anyone. Im just expressing my concerns, due to the information that I’ve studied on candida and fruit sugars. If I’m wrong, I welcome and appreciate new information. Thanks for all you do, Jen. Thank you, Jen. Ill check out those links and try to get my hands on that book and check out 80/10/10 and The Starch Solution.